Norgon Ambi-Catch Ambidextrous Magazine Release Button/Lever: Ambi-Mag Release/Catch Combat Advantages for Tactical Shooters | DefenseReview.com (DR): An online tactical technology and military defense technology magazine with particular focus on the latest and greatest tactical firearms news (tactical gun news), tactical gear news and tactical shooting news. In my tactical AR (AR-15 carbine) Frankengun/Frankencarbine article (February, 2010), I mentioned the Norgon Ambi-Catch (NSN 1005-01-537-6498), which is a pretty cool drop-in ambi mag-release/catch button/lever (ambidextrous magazine release button/lever) for tactical ARs (AR15/M16/M4/M4A1-type weapons). 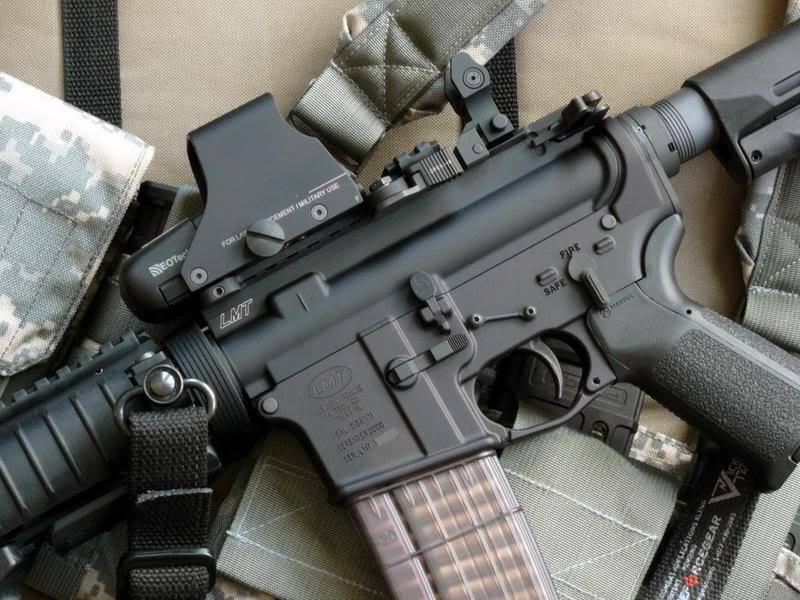 Well, as it turns out, DefenseReview (DR) writer/contributor Jeff Gurwitch is planning to install the Norgon Ambi-Catch on both his M4A1 Carbine-type combat weapon and his 3-Gun competition gun, which currently utilizes an Adams Arms (AA) Evo Ultralite ultra-lightweight short-stroke gas piston/op-rod (push-rod-type operating rod) AR carbine upper receiver assembly–and then he's gonna' run 'em at the range to see what's what…'er, how he likes it. I enjoyed speaking with you as well. Attached is a document which describes magazine release methods available with the installation of the [Norgon] Ambi-Catch. Serious users should train all of the methods and train both sides of the weapon in my opinion. Tactical pistol training includes "weak hand" engagements. Why would'nt you train "weak-hand" with your carbine? 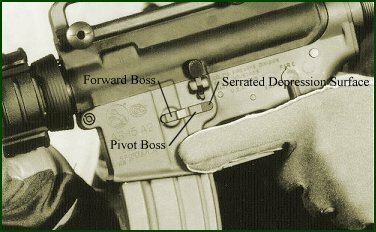 COL Coates (USMC 1st Force Recon, DET 1 and MARSOC) trained his right hand dominant Marines to check/change the magazine with the non-firing hand because the dominant trigger finger was on the trigger with a round in the chamber when checking/changing the magazine (point shoulder). We have had right hand dominant soldiers use our release in HMMWVs [combat Humvees/Hummers] (convoy) riding 'shotgun' engaging mounted from the vehicle. They become 'left hand dominant' due to their position in the vehicle. Manipulation of the controls with the firing hand are more efficient as the non-firing hand is being used to support the weapon in cramped quarters. Dominant eye/hand injuries are another reason you might be forced to "switch shoulders" in a fire fight. Proper use of available cover is another. The US Marine Corps and the Army stress engagements from the 'strong' shoulder as you are more accurate firing from the 'dominant' shoulder. The 'pieing' maneuver (corners of buildings, hallways and doors), however, exposes more of you to the enemy before you are able to identify him (right hand dominant soldier – left corner of building). He gets first shot at exposed body parts and this increases the chances of the "pieing" soldier getting wounded/killed. Not good. Most new generation tactical weapons include ambidextrous controls. The IC [Individual Carbine] requirement is for "fully ambidextrous" controls (all controls including the magazine catch). Our patented 'drop-in' magazine catch/release is designed to be the best solution for the existing US military inventory of weapons without a magazine release capability (M16 FOW). These weapons do not have a "fence" on the 'non-port' side of the weapon. Our release includes features that reduce the possibility of inadvertent release of the magazine by "bumping" equipment (right hand dominant carry). Our release has been used by right/left handed Canadian soldiers in combat (Afghanistan) in the C7A2. The Canadian Army has now started to outfit the C8s in the CA with our ambidextrous release (I guess it works for them). The main feature that sets our release apart from the rest [other manufacturers’ competing ambi mag catch/release buttons] is the ability to pivot without ‘camming’ on the exterior of the weapon. XXXX, XXXX, XXXX and others [other manufacturers’ competing products] ‘cam’ on the weapon to operate from the non-port side. All of these designs are more prone to inadvertent release than our design and will not function (non-port) if something gets lodged under the ‘[ping pong] paddle’ (stone/ice/twig). The XXXX release depression point is too far to the rear for comfortable actuation by the trigger finger. The XXXX release is too far forward for short fingers and is blocked by the magazine when using multiple magazine holders (MMH) and high capacity mags (Beta drum types). Our depression point is on the same axis as the port side magazine release button. Both XXXX and XXXX [have] potential 'snag' points. Let me know what you think about the information above and I would really appreciate your well informed opinion of the attached document. Description: Method 1 is also referred to as a “rapid reload”. The spent magazine is released with the trigger finger of the firing hand that supports the weapon at the pistol grip. The non-firing hand is used to simultaneously obtain, insert and seat a loaded magazine. Method 1 is useful in the standing and kneeling positions. Procedure: With the firing hand positioned around the pistol grip, support the weapon with the firing hand. Remove the trigger finger from the trigger. Extend the trigger finger forward and depress the magazine release button. Simultaneously, with the non- firing hand, release the handguard or vertical hand grip and remove a loaded magazine from a “weak side” ammunition pouch or Load Bearing Vest pocket. Orientation of the magazines in the pouch should allow the Marine to grasp the magazine at the base and pivot it around to engage the magazine well properly for insertion (bullets forward). Insert the magazine fully into the magazine well until the magazine is engaged with the magazine catch. Pull down on the magazine to check that it is secured. If the magazine fails to fully engage the magazine catch, tap the bottom of the magazine with the non-firing hand. Depress the bolt release to chamber a round if the bolt is locked to the rear. Return the non-firing hand to the handguard or vertical hand grip. Continue to engage the enemy. Description: Method 2 is also referred to as a “tactical reload”. The spent magazine is released with the thumb of the firing hand. The non-firing hand supports the weapon at the handguard or vertical hand grip. The firing hand is used to remove the spent magazine, retain the spent magazine, obtain, insert and seat a loaded magazine. Method 2 can be performed in all firing positions, but is especially useful in the prone position where the non-firing hand is used to support the weapon at the hand guard or vertical hand grip. Procedure: With the firing hand positioned around the pistol grip, support the weapon with the non-firing hand at the handguard or vertical hand grip. Remove the firing hand from the pistol grip. Bring the firing hand forward and grasp the body of the magazine. Extend the thumb upward and depress the magazine release button. Pull the spent magazine out of the weapon and secure it. With the firing hand, obtain a loaded magazine from a “strong side” ammunition pouch or Load Bearing Vest pocket. Orientation of the magazines in the pouch should allow the Marine to grasp the magazine at the base and pivot it around to engage the magazine well properly for insertion (bullets forward). Insert the magazine fully into the magazine well until the magazine is engaged with the magazine catch. Pull down on the magazine to check that it is secured. If the magazine fails to fully engage the magazine catch, tap the bottom of the magazine with the firing hand. Depress the bolt release to chamber a round if the bolt is locked to the rear. Return the firing hand to the pistol grip. Continue to engage the enemy. Description: Method 3 is also considered a “tactical reload”. The spent magazine is released with the thumb of the non-firing hand. The firing hand supports the weapon at the pistol grip. The non-firing hand is used to remove the spent magazine, retain the spent magazine, obtain, insert and seat a loaded magazine. Method 3 is useful in the standing and kneeling positions. Also useful in MOUT to check the condition of a magazine. Procedure: With the firing hand positioned around the pistol grip, support the weapon with the firing hand. Remove the non-firing hand from the handguard or vertical hand grip. Bring the non-firing hand rearward and grasp the body of the magazine. Extend the thumb upward and depress the magazine release button. Pull the spent magazine out of the weapon and secure it. With the non-firing hand, obtain a loaded magazine from a “weak side” ammunition pouch or Load Bearing Vest pocket. Orientation of the magazines in the pouch should allow the Marine to grasp the magazine at the base and pivot it around to engage the magazine well properly for insertion (bullets forward). Insert the magazine fully into the magazine well until the magazine is engaged with the magazine catch. Pull down on the magazine to check that it is secured. If the magazine fails to fully engage the magazine catch, tap the bottom of the magazine with the non-firing hand. Depress the bolt release to chamber a round if the bolt is locked to the rear. Return the non-firing hand to the handguard or vertical hand grip. Continue to engage the enemy." Great information! The upshot is that, according to Garrett, the Norgon Ambi-Catch is the best-designed and most reliable ambi mag catch/release button/lever made and available, and a very handy tactical AR accessory to have on a combat gun—so check it out. Editor's Note: In the accompanying photo (top right), notice the KNS Precision Non-Rotational Anti-Walk Hammer and Trigger Pin Set, which is another good product. Design elements combine to make a rugged and reliable ambidextrous magazine release. Serrated Depression Surface – Provides a "non-slip" surface for positive depression. Depression surface is located on the same axis as the original magazine release button (ejection port side of weapon). Depression of this surface disengages the Engagement tooth from the magazine slot releasing the magazine. Pivot Boss – Acts alone or in unison with the Forward Boss to provide protection from accidental release. Depression of this surface has a neutral effect on the action of the lever. Forward Boss – Acts alone or in unison with the Pivot Boss to provide protection from accidental release. Depression of this surface actually forces the Engagement tooth into a positive engagement with the magazine slot. Lever – Streamline design functions within the existing magazine catch slot of the weapon and is directly pressable by the user. Design characteristics protect assembly from snagging by equipment and foliage. At rest, the lever is completely housed within the magazine catch slot protecting the assembly from mud and sand. Engagement tooth – Increased dimensions provide for a more positive engagement with magazine slot. Bevels at bottom and rear of tooth allow for smooth insertion of the magazine into the weapon. Pin – Pivot pin is hardened to the same specs as Lever and Base ensuring long life and durability. Large head of pin is captured within the weapon at rest and cannot drop out when primary magazine release method is used. Easily removed by depressing the small end of the pin with the nose of a bullet or ball point pen (opposite side not shown). Base – One piece design is rugged and durable. A cavity houses the Mil-Spec spring (extractor spring-not shown) which provides positive tension to the Lever. The threaded portion of the shaft is machined for precision engagement of the threaded orifice of the original magazine release button. All magazines designed to function in an M16 rifle should be compatible with the Ambi-Catch™. If the magazine works with a standard magazine catch in your weapon, it will work with the Ambi-Catch™. Magazines that have a "insertion limiting rib" (see Orlite, Thermold, etc.) may be difficult to latch in some weapons that have a reduced magazine well bevel. Minor adjustment to the upper portion of the magazine catch slot of the magazine may be necessary for proper function. Depression Surface of Lever – The depression surface of the lever is located on the same axis as the magazine release button on the “port” side of the weapon. The location enables the shooter to depress the lever with the index (trigger) finger of the firing hand positioned around the pistol grip. Protection of the lever – The high profile of the bolt catch bosses help to protect the lever from accidental depression. The release is fully housed within the receiver protecting it from mud, sand and other debris that might inhibit function. The forward boss is protected from snagging by the semi-circular protrusions of the lower receiver. Retention of pivot pin – The large head of the pivot pin is "captured" by the receiver when the release assembly is at rest. Spring tension secures the pin within the release assembly when the primary magazine release button is used. The US Army recently awarded contracts for 2 MMH designs which are compatible with the Ambi-Catch™. Question: I am right handed and I’m worried about dropping the magazine accidentally if the weapon hits equipment. How does the Ambi-Catch™ protect against this? Answer: The Ambi-Catch™ has a low profile and can only be actuated by depressing the serrated portion of the lever. By design, the Ambi-Catch™ requires more force to release the magazine when it is fully loaded. The engagement tooth has increased surface area which resists releasing the magazine if the serrated depressing surface is “bumped” slightly. Question: The Ambi-Catch™ is in close proximity to the tab of the bolt catch. I am concerned about the possibility of inadvertenly dropping the magazine if I have to lock the bolt to the rear during an immediate action drill. Is this a possibility? Answer: None of the leading military or law enforcement training manuals advocates locking the bolt to the rear during an immediate action drill. The user ensures the magazine is securely latched, pulls the charging handle to the rear (hopefully ejecting the problem ammunition), observes the chamber, releases the charging handle (chambering a round), taps the forward assist and continues to engage targets. Locking the bolt to the rear is a wasted movement (economy of motion) and unnecessary. Some units train to transition to another weapon altogether and not waste time performing immediate action in the event of a stoppage in the primary weapon. Question: Will an Ambi-Catch™ work with multiple magazine holders (MMH)? Answer: Yes. The Ambi-Catch™ works with all of the common MMH designs (Mag-Cinch, CAA, THOR, etc.) The Isreali “V” type MMH requires a modification to ensure enough space between the magzines for proper function. If you are using the Isreali “V” type MMHs simply contact us and we will e-mail you instructions on the modification required. Question: Will an Ambi-Catch™ work with a Johnson Ready Mag? Answer: No. The Ambi-Catch™ will not work with a Johnson Ready Mag. If you need another magazine readily available for a quick magazine change, you should consider the use of a multiple magazine holder (MMH). An MMH does not permanently alter the configuration of your weapon. If you needed to use a buddy’s MMH or a Beta C-Mag, the Johnson Ready Mag will not allow you to do so. The Johnson Ready Mag adds weight to the weapon and is not designed for use by left handed shooters. Question: I think all tactical weapons should be configured with the same controls “issued” with the weapon so manipulation of the controls is not confusing if you have to use a fallen buddy’s weapon. What do you think? Answer: The Ambi-Catch™ only replaces the magazine catch of the weapon. The original magazine release button is retained. If someone has to use a weapon equipped with an Ambi-Catch™ he simply uses the exisiting magazine release button method he is accustomed to (right or left handed shooter). Users of the Ambi-Catch™ should train to use all six of the magazine release methods (three on each side of the weapon) to realize the full benefit of the use of our product. If an Ambi-Catch™ user has to use a weapon not equipped with an ambidextrous magazine release capability, he’ll do just fine. All newer tactical weapon systems have ambidextrous controls. Why not add an abidextrous magazine release capability to your weapon?" Previous: Heat-Seeking Missile Killer: Northrop Grumman Guardian Anti-Missile Laser System/Missile Defense System (MDS)/Counter-MANPADS Aircraft Pod (Military and Commercial Aircraft) vs. Russian KBM Igla-S (SA-24) “9M342” Man-Portable/Packable Fire-and-Forget Surface-to-Air Missile System/MANPADS.